After my long hiatus working (and/or drinking) in Seattle, during which I heard nothing whatsoever about actual news events, I have returned to my home with an amnesiac gap of knowledge (except for Hurricane Jeanne & learning that yet another Weather Channel woman is pregnant, also hilariously pointed out on Don & Mike yesterday). The debates are tonight and I'm at the point where I just want to get the whole damn election over so that I can move on with life either being totally depressed and seeking a job outside of the country or going back to political life as normal - not great but perhaps with a few more foreign country friends than now. However, there are little things that perk me up and hearing about the Lone Star Iconoclast endorsing John Kerry on NPR this morning was one of them. I have no association with Crawford, TX besides knowing that George spends a load of time there instead of my lovely city, but it can't be good for his ego to have a hometown newspaper put their weight behind Kerry. Ah-hahahahaha! Instead of watching those two yammer back and forth tonight about nothing of substance (because you can only talk so much - I want to see all this rhetoric in action) - Ms. Guerilla Blog, Sir Baku and I will be learning about Biomaterials from a Chemical Engineer at MIT. Sounds hoity-toity, eh? Somehow my man, through sheer persistence with the online ticket vendor, scored two tickets to the Pixies reunion tour show at DAR on Dec. 7. ROCK!! ON!!! This morning I was driving much earlier than normal to work, but still had to take the little side street shortcut to avoid the traffic light of doom near work. I like the shortcut because after being in an hour of gridlock, I'm suddenly driving through a peaceful green neighborhood with very wide streets and no hint of anyone awake. 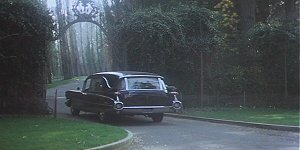 What made today different was the hearse parked quietly on the curvey street, not yet ready to begin the day - but this wasn't a normal hearse. This was full out Harold & Maude, white instead of black, with an old-school grill and a bit of rust tinging the seams - not exactly the car I'd like to see driving away my loved one to the cemetary. But pure nostalgia, especially on a grey foggy morning with a hint of pink sun. Woo-hoo, Packer season begins! And crazy season is almost over for me - leave on Friday, come back the next Saturday, and then maybe give my blog the love it deserves. Or more accurately, give my brain time to reflect on life. There is something I have noticed, though - two experiences, coincidentally both in Adams Morgan, witnessed by the same two best buddies - that made me realize I am actually a true resident of my not-so-large city. This may seem obvious after being in the area for 3 years, but I have been a nomad for about 10 years (moving from dorm room to apartment after apartment to new city times three). Although I've met many people, I still often feel like a stranger - both because of my transient lifestyle and the fact that my coworker and her parents have nicknamed me Suzie-Who, as no one ever remembers meeting me (and have decided I should be a spy). First we were strolling up 18th St. at night, on our way to enjoy drinks and the breeze of a rooftop bar, and my early-summer bus driver crawled by on the stopped-traffic strip. He's always yelling and leaning out the windows so I yelled 'hi' over to him and he got all excited and yelled greetings back. It was a surreal moment, especially since he used to drive the Rosslyn-Tysons route at 8 in the morning. And how often do you greet your bus driver in a bus while walking down the sidewalk. Second was yesterday, while enjoying people-watching during Adams Morgan Day in the cool temp of Anzu. DJ Greene was warming up the crowd and not five minutes after walking in, the guy I dropped earlier this summer for my man walks in. There we were, all together in one bar, and this went on for about 3 or 4 hours. It wasn't overly weird or anything, but I thought - this could only happen to a true resident. Usually I move away too quickly for those types of run-ins to occur. So I guess I have a home. For NOW, that is. Yep, I finally lost it to stress today. One minute I was ok, and next I was purging my ducts in the car, catching every single red light ever, and noticing that for some reason the back of my thigh was bleeding (onto my grey pants) about 2 minutes before I got to work. I remember thinking, 'Boy, if I was my normal self today, I would find everything funny for its utter ridiculousness'. However, 7 hours later, I am still on auto-pilot. Perhaps I shouldn't have listened to all the news coverage about the Republican convention, or listened to my coworker announce 'Only 2 weeks 'til we leave for Seattle!' or acknowledged the existence of the entire accounting/data services department...I guess I was feeling masochistic. The king size bag of M&Ms was a smart move, though. And now for something completely different, if anyone would like a fancy-schmancy GMail account, I have six to give away to anyone that wants to spread more love to Google and their projects. Margaret made a good case for the joys of having too many email accounts at the beginning of August (6th), so there ya go.